Last Updated: January 13, 2019 · Published: January 22, 2018 By: Asian Caucasian 4 Comments This post may contain affiliate links or sponsored content. These baby O’s cook quickly so we don’t recommend making this after four glasses of wine ’cause you’ll need to pay attention! We pre-cooked them for one minute in boiling water, then marinated them in the fridge for a few hours before grilling. The best part is this to-die-for Vietnamese Nuoc Cham sauce that’s drizzled all over the top. Serve this as an appetizer for your dinner guests and don’t tell them how easy it was to make! Beautiful baby octopus can be found at most Asian markets and select specialty stores. Try Whole Foods! These little cuties grill up in a heartbeat! Make sure you buy them already cleaned or have your fishmonger do the cleaning for you. Bring a pot of water to a boil. Turn off the heat and add the baby octopus for one minute. Remove and drain under cold water to stop the cooking. Place the baby octopus in a large sealable baggie. In a small mixing bowl, whisk together the lemon juice, garlic, olive oil, red pepper flakes, salt and pepper. 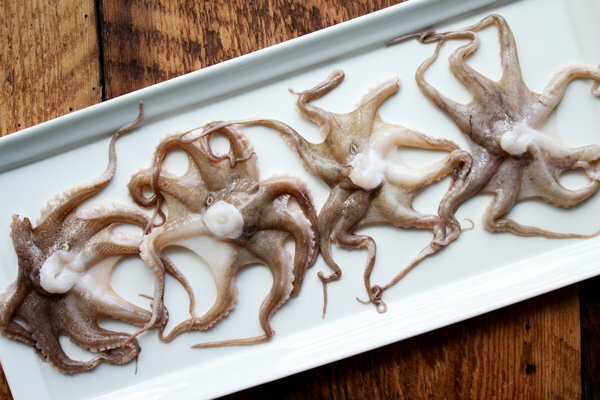 Pour the marinade over the baby octopus and marinate for at least two hours or overnight in the refrigerator. Spray your grill or grill pan with cooking spray, and heat to a high heat. Place the baby octopus on the grill and use a heavy pan or grill press to flatten the octopus while it cooks. Grill for 5 minutes on each side until nice grill marks appear. 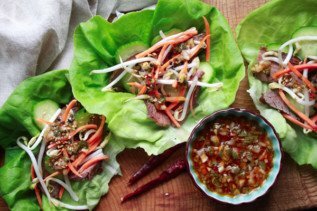 Serve with the nuoc cham dipping sauce on the side! Grilled to perfection, these little cuties make a great appetizer for your dinner party. 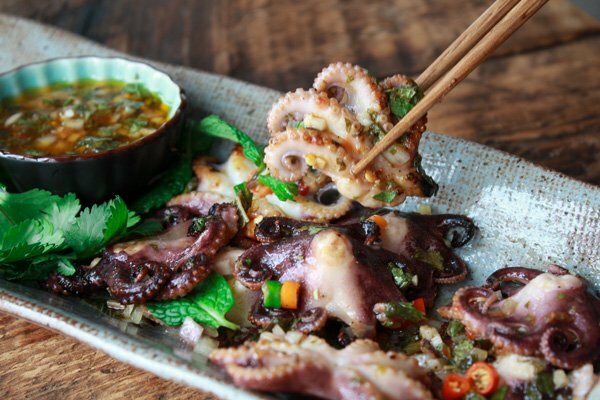 Grilled Baby Octopus cook so quickly so keep your eye on the ball! 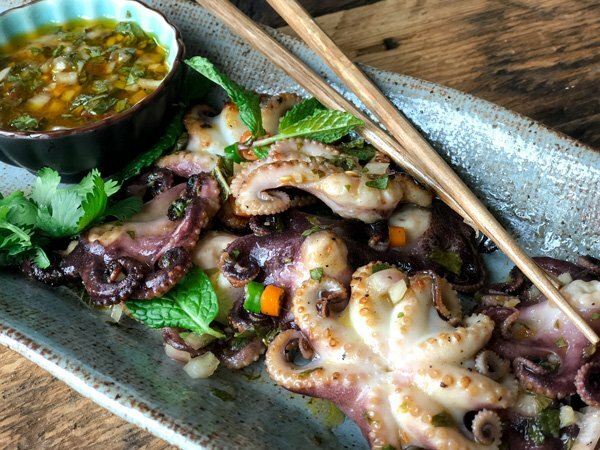 Tender grilled baby octopus combined with a Vietnamese Nuoc Cham sauce make this appetizer dish a winner! In a medium glass mixing bowl, whisk together olive oil, fish sauce, lime zest, sambal oelek, cilantro, mint, shallots, garlic, and brown sugar. Taste for seasoning (more salt). Store in the refrigerator for up to three weeks or freeze for up to six months. 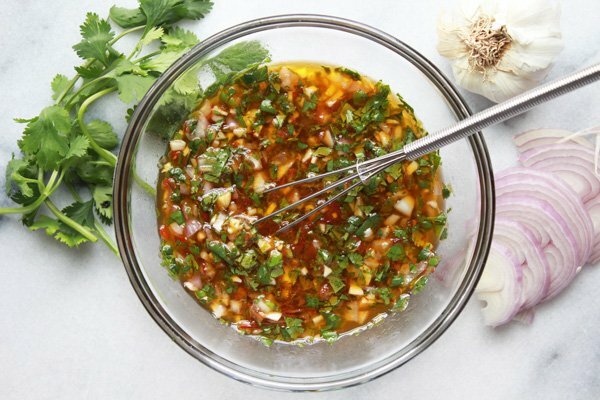 Nuoc cham makes a great dipping sauce for so many Asian dishes. Fill a large pot with 5 cups of water and bring to a boil. Turn off the heat and add in the baby octopus for 1 minute only. Remove and strain the octopus under cold water to stop the cooking. Let octopus sit to room temperature when ready to grill. Heat a stove-top grill pan or outdoor grill on high heat (spray with cooking spray). Place the baby octopus on the grill and use a heavy pan or grill press to flatten the octopus while it cooks. Grill for 5 minutes on each side until nice grill marks appear. Remove from heat and place on a platter. Pour the Nuoc Cham sauce over the top and garnish with cilantro. To make the Nuoc Cham Sauce: In a medium glass mixing bowl, whisk all ingredients together and taste for seasoning (more salt). Store in the refrigerator for up to three weeks or freeze for up to six months. Makes a great dipping sauce for Asian dishes. 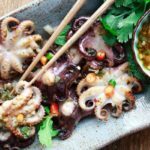 You can find baby octopus at your local Asian market, or specialty grocery stores. 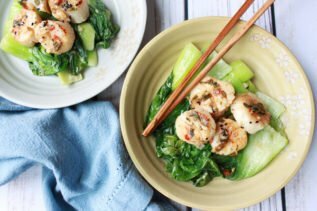 Seared Chili Scallops with Baby Bok Choy. These little sea creatures are so tasty! Love this with the Nuoc Cham dipping g sauce, so tasty! These baby octopus cook up so quickly too! Little bites of heaven! I used to be skittish about eating octopus and squid, but have grown to love this true delicacy! 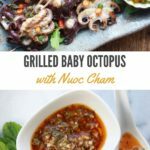 This recipe is so easy and the nuoc cham sauce puts this appetizer over the top! Thank you! 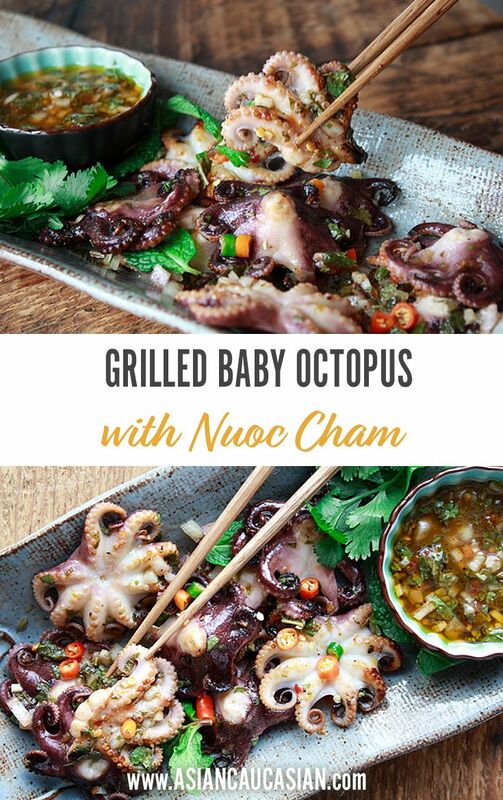 So glad you’re enjoying these delicious sea creatures and my baby octopus recipe! It really is a treat, right?